Kano shihan katame waza - what is this? Interesting - I wonder what hold this is, or was he caught in transition from one hold to another? Re: Kano shihan katame waza - what is this? 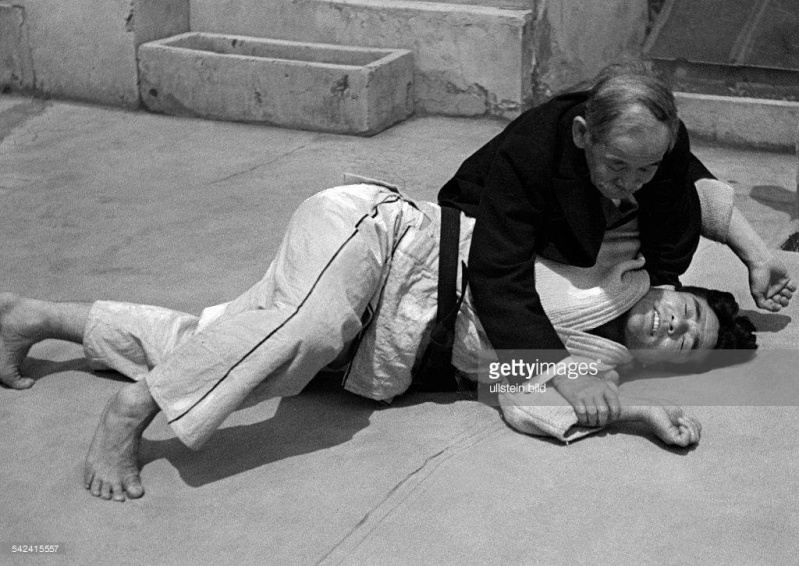 that picture was taken on June 12th, 1933, when Kanō-shihan, assisted by Takasaki and Kotani, demonstrated his "Jiudo" at the "Erster Österreichischer Jiu-Jitsu Klub" (the - so-called, as it hadn't really been the first - "First Austrian Jiu-Jitsu Club") in Vienna, by the prominent Austrian reporter and sports-photographer Lothar Rübelt. Together with other pictures from that event, it was published several times. Kanō-shihan primarily had been here to attend the 1933 IOC session, held in Vienna. On December 16th, 1934, Lothar Rübelt himself published the pictures once again in a Viennese newspaper, as illustrations to his article "Jiudo, the soft way. From a talk with Otto Klimek, the Austrian representative of Kano-Jiudo". Otto Klimek, by the way, was one of the founders of the club in question, and had organized that visit of Kanō-shihan to his school one year before. When Kanō-shihan had journeyed on to Germany, where he led two seminars that year, Klimek followed him, was graded nidan there by Kanō himself, and with that became the first Austrian yūdansha of Kōdōkan jūdō ever. "Finte am Boden, um Widerstand hervorzurufen, der dann zur Besiegung des Gegners führt. Gezeigt von Exzellenz Kano"
("Faint on the ground to evoke resistance, that leads to the defeat of the opponent. Demonstrated by excellency Kano"). Therefore, the position shown in this picture seems to have been definitely explained to the attendees as a transition, leading to an actual, decisive technique. What happened around the occasion, that picture had been taken at: Kanō-shihans lecture about Jūdō had been announced in Viennese newspapers as a public event free of charge. It was scheduled for June 12th, 1933, at 8 pm. A newspaper article about the event, that appeared some days later, refers to the lecture having taken place in "the hall". That's definitely not, what can be seen on the photos. Additionally, only club-members can be seen in the background of the shots. Therefore I think, for better lighting conditions, the pictures where taken earlier that day at the training area on the rooftop, while the official lecture was held in the hall later in the evening (at 20:00). I also know, that at the same occasion not only photos were taken, but a motion picture for the Austrian newsreel was also produced, that appeared in the Austrian cinemas afterwards. Unfortunately, today it is one of the missing reels, but I want to believe that, perhaps, somehow or other, it will recur some day. The political situation was very difficult these days, especially between Austria and Germany. In Germany, the "Nazis" already ruled, and in Austria their sympathizers rampaged on a regularly basis, stopping at nothing, so that even assassinations with firearms or bombs were commonplace. It was the time, when the NSDAP became banned in Austria and German goods were boycotted by parts of the Austrian population. After the expulsion of Hans Frank, the Bavarian minister of justice from Austria, Hitler declared the "Tausend-Mark-Sperre" (in effect from May, 27th, to July, 11th, 1933) against Austria, to further hinder free traffic between the two countries and especially to restrain German tourists from visiting Austria. The goal was, to harm Austrian's economy, of which tourism already was an essential part. However, it couldn't have been a very easy task for Otto Klimek, to follow Kanō-shihan to Germany, under those conditions. Perhaps he didn't go to Berlin with Kanō, but only joined the seminar in Munich, which took place later, in September 1933, I think.